This well-preserved work is a fine example of Berchem's enduring fascination with the effects of light that so suffuse his pictures after his travels in Italy between 1651 and 1653. Although not itself a nocturne, in its beautifully restricted palette and subtlety of tone it might be compared with his few examples in that field, including the Landscape with crab catchers by moonlight of 1645 (Cleveland, Ohio, Museum of Art, on loan), the Moonlit landscape with herdsmen of 1652 (Hanover, Niederländisches Landesmuseum) or the drawing of A shepherd family travelling at night of 1655 (London, British Museum). Indeed the slight similarities with the latter drawing perhaps reflect the artist's initial thoughts on the theme from which derives the present work, which may tentatively be dated to later in the artist's career, in the 1670s. 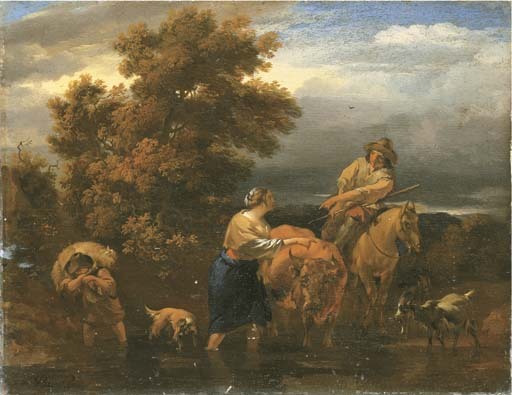 The motif of peasants crossing a ford was a frequent one in Dutch Italianate landscape painting; Blankert (Dutch 17th Century Italianate Landscape Painters, 2nd edn., Soest, 1978, p. 95, note 1) demonstrated that Pieter van Laer was the first to take up so many of the subjects that were to become popular among such Italianate painters as Asselijn, Berchem and Du Jardin, and it seems likely that the present theme was also Van Laer's invention, his Landscape with horsemen in the Uffizi, Florence, being one of the earliest such depictions.